Goodbye Mazon Discount on Nostrand (btwn St. Marks and Prospect)? Note: You should not freak out yet: It has been on the market for over a year. More than 4 years later, this store now has "everything must go" "33% off liquidation sale" sign all over it. This site seem a good candidate for demolition and rebuild. Some of the stuff I saw in there might have to be thrown out. Hi, I am the owner of 706 Nostrand Avenue. It was never Mazon's. He was the tenant. The space is up for rent. Hey @ckjets...so whats the plan for 706 now? If the bar has signed a lease, can you disclose how long the lease is for? The building is for lease. Exclusive with Eastern Consolidated. https://www.easternconsolidated.com/listings/706-nostrand-ave/ The bar was suppose to sign next door, I was never part of that deal. All I know is that the deal was never executed. If I am understanding this correctly, @ckjets owns the single story building the left, 706 Nostrand. It is still for lease. Meanwhile, a bar is/was considering 706A, which is the two story building labelled "furniture and toys". Unknown if anything is in the works for the the structure labelled Furniture Store ....on the far right next to Tribeca Pediatrics , 704 Nostrand. That is correct @whynot_31. That deal is not happening next door. Tribeca Pediatrics is just renovating from my interactions with them, they will return to that spot after all is done. A whole slew of stores are for rent on that block. Would make a nice luxury highrise. I'd love to see a lux highrise. That block is DUMPY. Who wants to see a luxury high-rise? Bleh.. If a large enough lot was assembled, it could feature a building like the new one at 720 Nostrand: http://www.brooklynian.com/discussion/44237/720-nostrand-empty-lot-was-drilled-for-core-sample Same zoning. Looks like CB8 is reviewing an application for this space at the SLA meeting tomorrow - from the agenda: "2. 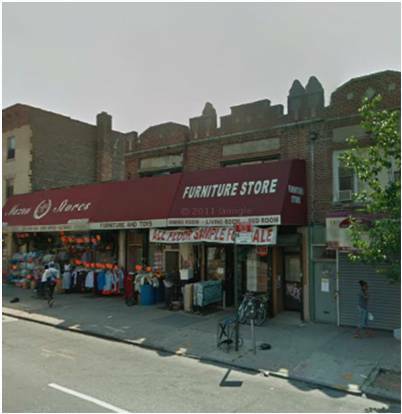 Bar 704, 704-706 Nostrand Avenue – Full (St. Marks/Prospect) (Patron dancing, live music, DJ, security, rear yard)"
The smart bar owners wait until their all license is well underway before signing a lease, so that is good news.